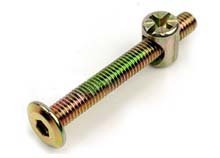 Hex Socket Furniture Screws , Flat head with chamfered edge . it used with Cross Dowel Nuts for connecting purpose. We’re professional manufacturer of furniture screws in China, supply different type furniture screws.